I like trains. I also like going on holiday. It’s also an awful lot easier to combine the two than a lot of people imagine, which is the whole premise of my bible for European train trips, themaninseat61.com. Mark Smith, the man who is, more often than not, in seat 61, runs it full-time and has far more advice than I can offer here. However, I HAVE recently travelled 2,210 miles by train, and you don’t do that without picking up some useful tips for others. So please consider this a companion piece to Mark’s excellent site. 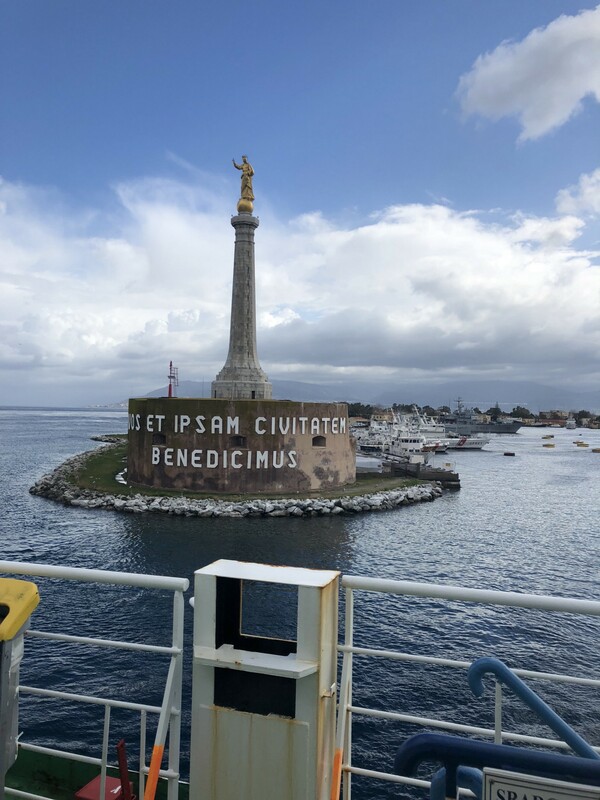 Leaving Messina in Sicily for Villa San Giovanni on the Italian mainland. Planning; how do you DO all this? My recent trip to Sicily wasn’t my first trip in Europe by rail. I’ve visited Paris and Brussels a few times by Eurostar, which I like to think of the ‘nursery slopes’ of European rail for Brits. I’ve also travelled to Seville by rail (a bit more complex) and Bordeaux (a very easy change in Paris and a high speed TGV). The first place I start with any trip that requires more than one change is a blank piece of A4 paper, as I find it easier to write out my plans in long hand. It’s a good idea to have more than one piece of paper, as there’s often more than one way to get to your desired destination. Once you’ve nailed down your preferred route (depends very much on what you actually want to do, and if you’d like specific stopovers), then you’re most of the way there. Why Sicily, and why this way? 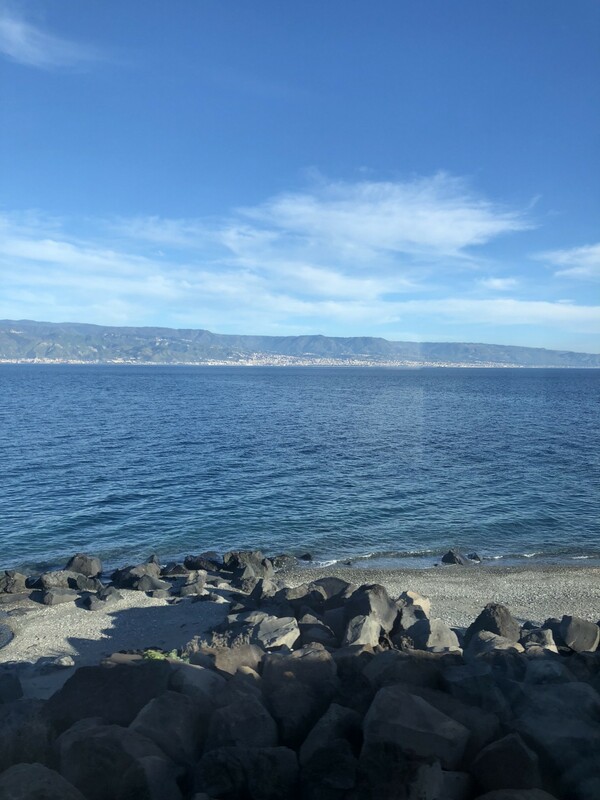 Well, it’s probably not surprising that I would be interested in seeing the beautiful island of Sicily, but judging from the reactions of others, most people aren’t even aware that you can get there by train. I wouldn’t be either, were it not for Mark’s site and the BBC programme ‘Great Continental Railway Journeys’, where I saw Michael Portillo cross the Straits of Messina by train ferry. This is a form of transport where train carriages are shunted onto a roll-on, roll-off ferry, with locomotives being swapped around either side. Of course, if it wasn’t for the fact that British Rail’s Night Ferry across the Channel, which also carried train carriages, hadn’t been scrapped in 1980, when I was a toddler, then this form of transport would be far less of a novelty for me! So, from the start, this was intended to be a travelling holiday, with the mode of transport just as important as the destination. With that in mind, it’s useful to consider just how long the travelling will be, as it will have an impact on the type of tickets you book. Coming into Villa San Giovanni by train. So, how do you get from London to Sicily by train? Mark’s site lists several alternatives, with day trains, sleepers and longer ferry services than the one across the Straits of Messina. After considering several itineraries, I decided taking day trains would probably suit our travel dates and goals for the holiday the best. Out of all the holiday planning, getting from London to Paris and back is the easy part. Eurostar run relatively frequent services, and you can give yourself at least an hour to cross Paris (we use the RER/Metro, but it’s not the only way). It’ll be a minimum of 2hrs 15mins on the Eurostar, and you need to check in at least 30 mins in advance. However, it’ll be the only leg where you’ll need to go through passport checks if you keep within the Schengen Zone once you arrive in Paris. Travelling onwards from Paris is the section where you’re a little more at the mercy of service frequencies. There are SO many ways to get down to Southern Europe from Paris, but the general rule with day trains is that the furthest you can (reasonably) get in one day is a major town in the north of Spain or Italy. Getting to Seville requires an overnight stay in Barcelona, whilst this trip required an overnight stay in Milan (you can also consider Turin). If you’re planning to depart from London in the morning, then you’ll be relying on the afternoon services at around 14:30, so factor that into the Eurostar that you take. Arriving in Paris at about noon is a reasonable goal. So how long are these trips? France’s high-speed train network is excellent and SNCF’s TGV trains (soon to change name) are marvellous examples of comfortable, pragmatically designed trains, but none of this will change the fact that the journey from Paris to Milan will take just over 10 hours. If you’re not delayed, that is, and we were on the way down through the Alps. It was certainly a scenic delay, but it takes me to my next tip; book any trip over 5 hours in First Class if you can possibly do so. The perks vary widely, but on the TGV, you tend to get more leg room and a trolley refreshment service. The leg room in Second Class is better than that in Standard Class on the Eurostar, but in my experience, the extra room in First Class really does make the difference. 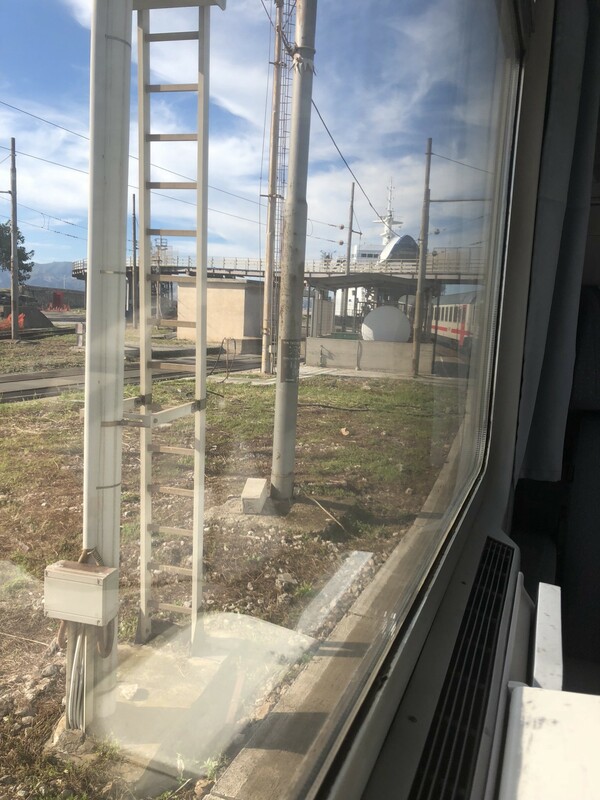 A side point; the TGV service to Italy is a single decker, attached to the common double-decker until the service splits into two at Lyon, where the double-decker continues to Grenoble. Presumably the service to Grenoble is a lot more popular than the one to Milan, as although the train’s perfectly comfortable, it’s certainly of a certain vintage. I *think* both classes on TGV have plug sockets, of the two-pin French type, and on a long journey, you’re likely to need them! Phew! One thing I should say off the bat here is that I made a slight error when trying to find our hotel on the first night. I’d got mixed up and assumed that I’d booked a hotel close to Milan Porta Garibaldi (the station you arrive in from France) for the first night, when I had actually booked it close to Milan Centrale, from which services run to the rest of Italy. If you’re close to a Milan Metro station, you shouldn’t have much trouble (or, indeed, you can take a taxi), but it’s an important thing to consider when you’re arriving late at night or departing early. I could have done without the initial confusion when we arrived at about 22:30, but I certainly appreciated the short walk to Milan Centrale in the morning, which I had initally planned and forgotten all about when I arrived…incidentally, leave time to get to the first floor concourse at Milan Centrale (Milan Porta Garibaldi & Roma Termini have ground floor concourses). We didn’t spend any more than an overnight stay in Milan, which was understandable given the number of days we had available, but was a shame as we saw very little of the city. Perhaps a day on either leg of the trip might have been good if we’d had a little more time, but it is an ideal excuse for a separate Milan and Turin trip! From Milan, we took a fast Italo train to Rome, which has fairly standard legroom in standard class, and snacks via vending machines, which, helpfully, take Euro notes! One practical tip about Milan/Rome; it has both French-style sockets and the relatively new three-pin Italian socket which requires a separate adaptor. The three-pin socket is standard on Italian trains and Southern Italy, so be warned! We managed to pick up an adaptor in Rome Termini, but we would have been in considerably more electric distress if my partner John hadn’t thought to do so. We hadn’t been to Italy for a few years and missed a standards change! The concourse at Milan Centrale. We opted to spend a couple of days in Rome as we’d done a flying visit years ago and I very much wanted to see the Colosseum. We did so and I got in free due to it being International Womens’ Day, which added to the general awesomeness of the occasion. I’m very pleased that I decided to book a hotel next to Rome Termini (of which there are many). It wasn’t the absolute height of luxury, but it was good enough and the location very useful when we had to get the 07:26 to Syracuse in Sicily. There are actually two services from Rome, with another departing at 11:26 in the morning. It very much depends on whether you want to arrive in Sicily in the early evening or late at night. Being able to go out for dinner once we arrived in Syracuse at 18:30 was a BIG plus, as one important aspect of the train to Sicily is that no refreshment service is available on the train, save an enterprising soul at Naples Centrale who charged us €3 for a can of Pepsi, as the train spends a little time there. We bought bread, water and snacks the night before, and between us, we probably got through two or so bottles of 1.5l water, so feel free to use that as a guide. There’s also quite a lot of waiting around at Villa San Giovanni and Messina Centrale stations, as this is where locomotives are swapped and carriages shunted on and off the ferry. There were announcements at VSG, but there wasn’t much guidance on the way back at Messina. The main thing to stay on the train until it’s made plain that the boat staff would like you to get off; they will provide an important extra step for the descent from the carriage to the boat deck, and the route to the top deck should be quite obvious at this level. Fortunantely, TrenItalia provide train tracker information on their website, which allows you to see whether the service is keeping to time. Despite everything, we came into Rome Termini only 12 minutes late (our connection to Milan was 24 minutes later at the same station), and despite the reputation Sicily has, we were only 5 minutes late into Syracuse. It’s also worth saying that TrenItalia definitely use their, er, more ‘well-loved’ rolling stock for this route. On our way down, we had an old-fashioned First Class compartment, with a toilet in our carriage that was actually open to the track. It was certainly a bracing experience! Old-fashioned or not, it’s also worth saying that only First Class have plug sockets (three-pin), so it’s definitely the better option if you can manage it, and it certainly seems that First Class is much better value on the French and Italian railways than in the UK. As with most rail tickets, it all depends on when and where you travel. Being shunted onto the ferry at Villa San Giovanni. Due to our stopover in Rome, our route diverges from the one Mark Smith recommends, where all the action is in Naples. 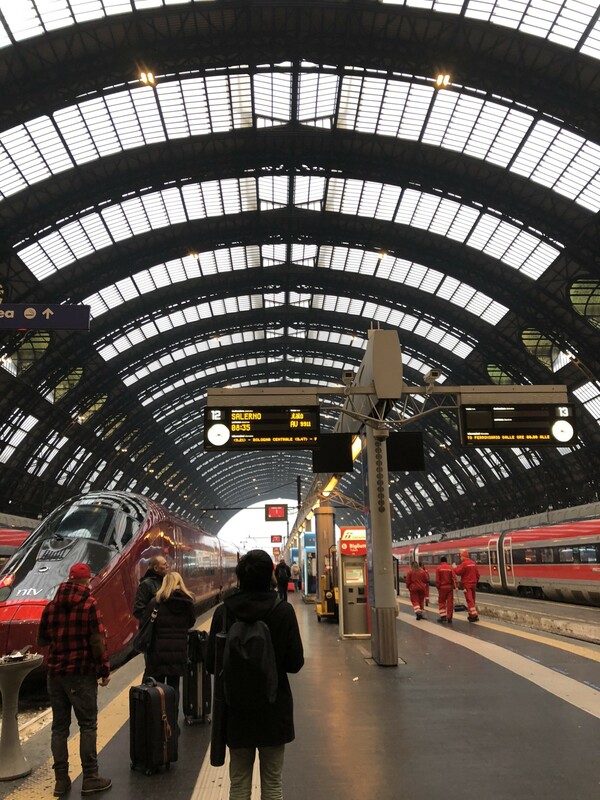 It’s worth saying that our return via Rome was a little delayed, which caused us a little concern, but that we were actually waiting to board the train to Milan in the end, as Rome Termini is quite a good place to change. It has a long concourse housing the vast majority of the platforms, with three or so ‘gates’ where tickets are checked for the platforms associated with the gates, so changing is fairly speedy. Mark’s route allows a delay getting into Naples on the way back up, which is entirely sensible, but it does seem to require a bit of fiddling on sites such as loco2.com in order to bring it up, as it tends to look for the first available connection. You will still be looking at a late arrival in Milan, no matter what; 22:00 at the earliest. I’d recommend researching yourself on the various ticket sites or paying the surcharge for an agency, as their knowledge could be really useful to you. Italo, a new train operator, are using Milan and Rome’s out-of-town stations, Rogoredo and Tiburtini respectively, and so two of our tickets were booked to those. Both services called at the main stations of Centrale and Termini afterwards, but we got off at the stations on our tickets and completed our journeys via the Metro because neither of us had the Italian for an argument with a ticket inspector. However, there appears to be nothing really stopping you staying on the train! I said at the beginning that I thought of this as a travelling holiday, and we certainly saw all sorts of things that we wouldn’t have seen from a plane cabin. A real highlight of the TGV trip was the section through the Alps, with an actual snowstorm at the ski resort Bardonecchia on the way back. The route from Rome/Naples down the front of Italy’s ‘boot’ to its ‘toe’ at the port of Villa San Giovanni is mainly down some achingly beautiful coastline, and through some very pretty mountain valleys. I wouldn’t have swapped the experience of my carriage being shunted on and off the ferry for a plane ride, nor feeling the sea breeze through my hair whilst crossing the Straits of Messina. The carriages form two separate trains once you’re at Messina (and join back up on the way back), one taking the ‘top’ route to Palermo, and the other down the east coast to Syracuse. The coastal route to Syracuse, again, couldn’t be beaten by plane. It really all depends on what you want from your holiday, and although Mark probably wouldn’t like to hear it, there are certain places in Europe where flying may be an easier option. Although given the general stress of flying, the definition of ‘easier’ is probably up for discussion! In any case, travelling long distances by train is not only quite easy, it’s also very enjoyable. If you like train travel, go for it! Destiny from Mongrels is my spirit animal.